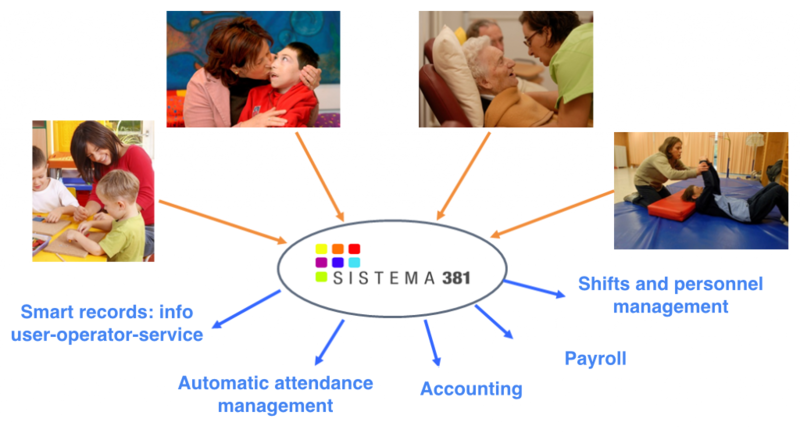 Sistema 381 is a management software that aims at coordinating and handling all the activities of the organization, and specifically of social co-operatives. Our ambition is to simplify the management of all the activities, avoiding wastes and errors, saving on operational costs and at the same time improving the service quality. Our solutions have been specifically designed for any requested service: home care, day care centers, kindergartens, educational services, nursing homes, communities, as well as canteens, cleaning services, green environment management, but also for the attendance management through an automatic reporting to the payroll software. Sistema 381 was built and developed over the last 10 years, taking into account the constant suggestions and requests of our customers. 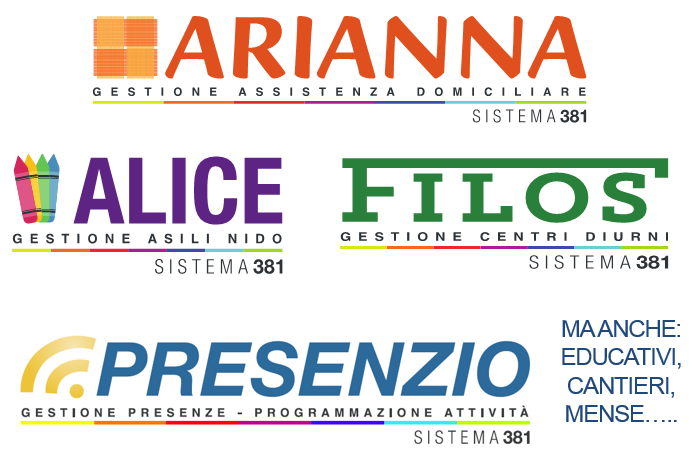 Its first version was software Arianna and starting from it several modules have been developed, among which new Arianna (home services), Presenzio (management of attendance and scheduling shifts), Filos (day care centers), Alice (preschools). Sistema 381 is a web system for efficiently collecting and processing information about users, operators and contracts, providing as output those services that are essential to speed up and simplify the management of the social enterprise. It can send/receive information to/from the payroll and accounting software, allowing you to manage all of the administrative processes of the company. Services Management: Connection amonf operator-user-service through proper permits and licenses. Automatic reports for accounting and payroll. Management control: it is possible to visualize the cost of the personnel and the total number of working hours, or divided per month,broken down by cost centers, as well as direct and indirect costs. To calculate the total personnel cost, it is possible to use both the standard cost and the actual cost (which includes contributions, TFR, taxes, etc.). The software functionalities are organized as modules, so to allow Sistema 381 to be customized according to the specific need of the client. Web-based system, thus accessible from office, home, hotel… All you need is an internet connection. Management of staff registry together with the general attendance (for reporting and for the payroll). Automated collection of overall attendance in the structure or in the territory, through the use of fixed or mobile stampers (for the home care services). Coordination and management of the various services (management of contracts). Each operator-user is connected to the service it provides-receives. 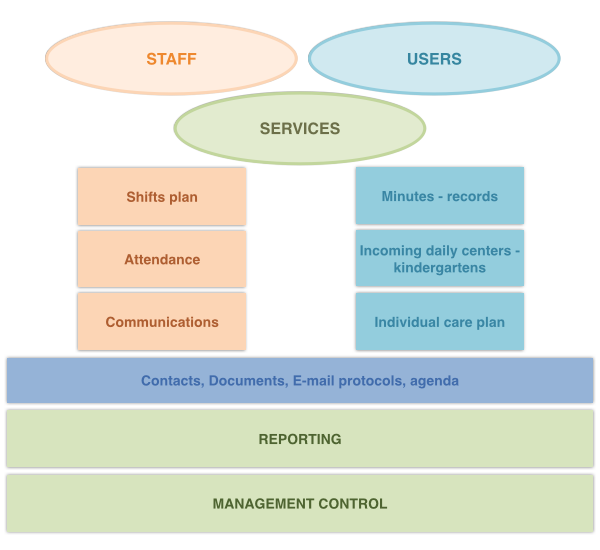 Each user can have multiple roles in the various departments, and each user can receive more services, but the data registry remains unique. Staff attendance in day centers and nurseries (providing a summary of the specific period or place of residence). Individual plan, diaries, reports, audits. Export report – MS Word / Excel. Statement of personnel expenses, broken down by committed service. Analysis of the financial statements with proper statistics based on type of users or co-operatives (for consortia). Schedule, calendar for deadline reminders (contracts, user-operators birthdays ..). E-mail communication and protocol (allows to catalog all official input/output communications, connecting any documents to the registry of the person, legal entity, thus enabling an easy search of information through dedicated filters). Specific module for course management and organization for the staff. System 381 is available in SAAS mode or can be installed on a server at the customer’s site. In SAAS mode, i.e., in CLOUD, the software is not installed locally on the computers or on servers owned by the client, but it can be used through a common Internet connection. This means that, in addition to the software itself, we make available to the customer a hardware and software technology platform, whose maintenance in each local sites would require significant cost of installation, maintenance and technical personnel . The data is automatically and securely backed up. Sistema 381 is developed by our partner SAIDEA Informatica and distributed by Social IT.